Before you read further I must warn you- ” Baking Breads can be addictive”. There can be nothing more rewarding than a perfectly baked bread and with it I get a big hug from my four year old daughter. She can not differentiate between various breads and keeps singing ” Hot cross buns…” through out the day, when I am baking bread. Measuring the ingredients is very important. Use measuring cups and spoons. Check the date of packaging of the yeast. I use instant dry yeast which can be directly used in the recipe. While using active dry yeast, Put the yeast in 1/4 cup lukewarm water with 1/4 teaspoon sugar, and keep it aside for 5-10 minutes. This process is called proofing. Ensure water is neither too hot nor too cold, just warm. Instant dry yeast can be used directly in the recipe. It is important to proof the yeast, to ensure that the yeast is good. If the yeast is not good you will see very little bubbles forming. Kneading the dough requires a lot of space so clean the kitchen counter well. I cover the counter with cling film to ensure a clean surface before and after kneading. Kneading the dough is a very important process as it helps in forming gluten and distribute the gasses released by the yeast uniformly. This makes the bread / buns / rolls soft , spongy, airy and light. 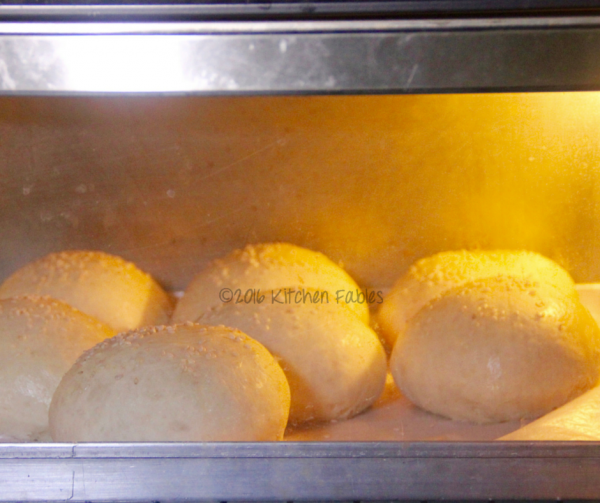 My family and friends love home made breads, buns and dinner rolls. 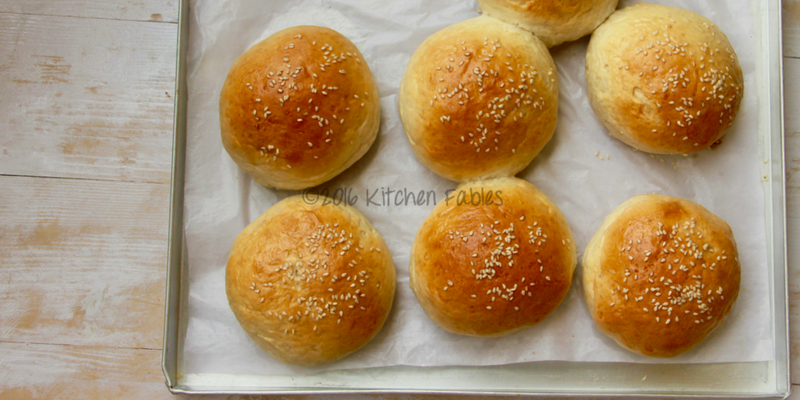 I have baked hundreds of dinner rolls for parties at home, and initially I used to be surprised when they would get over, not anymore. I baked these buns especially for my Husband and daughter to make Burgers as a treat on Father’s Day. When I bake buns at home I have to keep aside a few for my daughter’s school snack box. It may surprise you but baking breads is simple. 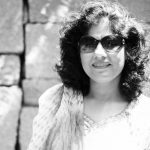 Get the right ingredients and measure correctly. 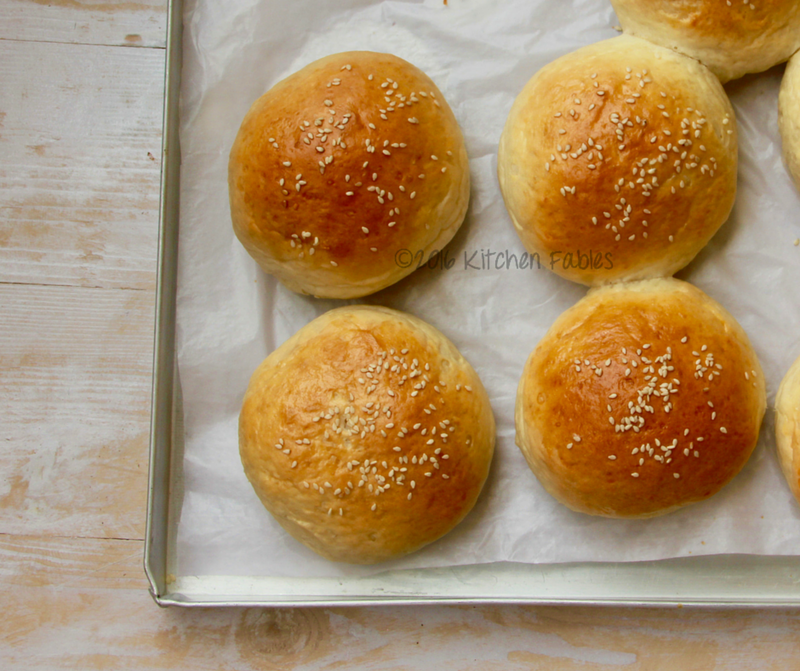 To start with try this ￼ easy recipe for baking fresh burger buns at home. Don't forget to add some love !! If you are using active yeast then in 1/4 cup warm water stir in yeast and sugar and let it sit for 5 minutes , till it becomes foamy. With a hand blender beat sugar and butter together. When the butter-sugar mixture becomes a pale yellow and light , add egg and blend. Add the yeast mixture, scrape the extra and blend till it combines. Add milk & remaining water and blend. Gradually add 2.5cup of water and mix flour until it combines well with the mixture. Change the hand blender attachment to dough hook. Add 2 cups of flour and mix ( 4-6 minutes) till dough combines well and is sticky. Sprinkle a little flour on the clean kitchen counter and transfer the dough. Knead the dough for 8 to 10 minutes till the dough is smooth. If the dough is very sticky add a little more flour. 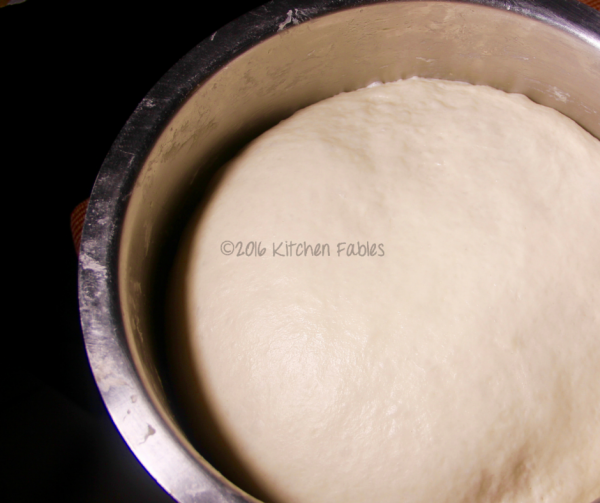 Dough should be soft and smooth. Cover the baking sheet with a wet towel or cling film and keep it in a warm place to rise for forty five minutes to an hour, or until double the size. In the last 10 minutes pre heat the oven at 180 degrees. Lightly beat an egg and add a table spoon of milk and brush it on the buns . 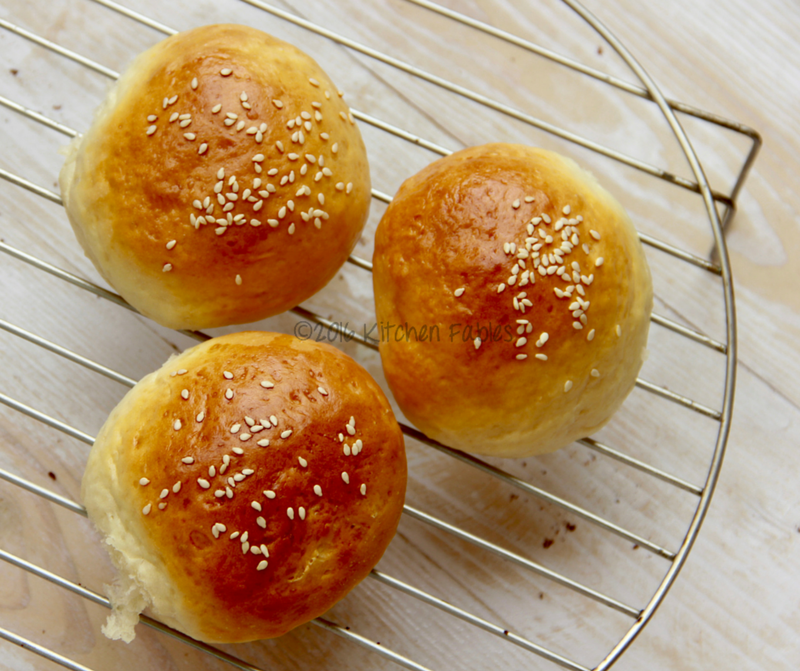 Sprinkle sesame seeds and bake it in the oven for baking for 15 - 20 minutes , till the top of the buns is golden brown. Take it out from oven and brush a little butter on top. Serve warm or for later use, allow it to cool and store in an airtight container. If you ask my daughter or husband it goes well with just about anything.